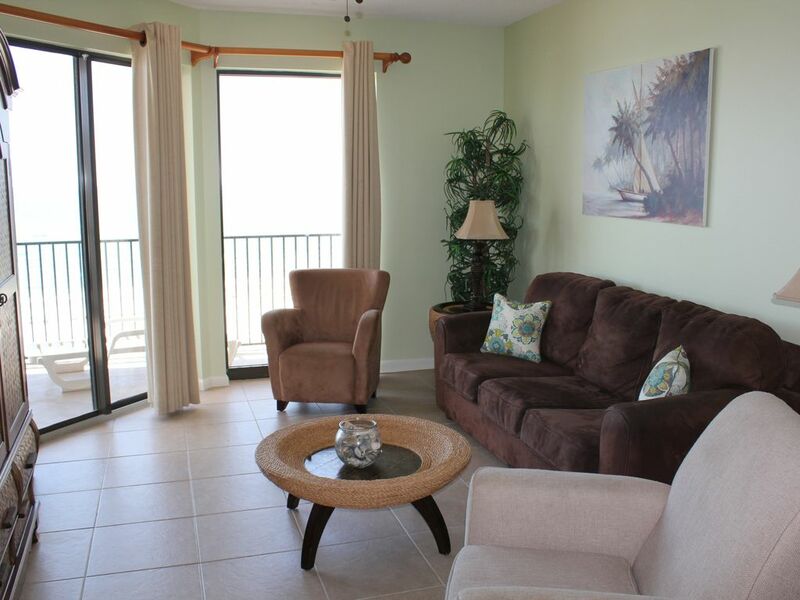 Beautifully upgraded 11th Floor Beachfront Condo at Phoenix VII. Sleeps: 6-8; Beds: 1 king in master bedroom (pillow-top mattress), 2 doubles in guest bedroom (with new memory foam mattresses - May 2018), 1 sleeper sofa in living room. More updates in May 2018: new paint throughout and some new decor to match! Interior Appointments: Fully equipped kitchen, wireless internet, 3 TVs (flat screen TVs in living room and both bedrooms), 3 DVD players, stereo, CD player, tape player (yes, it's even dual cassette, so you can teach your kids how to make a mix tapes), new washer and dryer as of January 2016, gulf front balcony accessible via living room and master bedroom, Egyptian cotton linens. We have the ideal vacation that you've been looking for. Come spend a week in this spacious (1,100 square foot, 10' ceiling) two bedroom, two bathroom beach front condo and escape life's usual hustle and bustle. Located in the heart of Orange Beach, just minutes away from Gulf Shores, AL, & Perdido Key, FL. The Master Bedroom and Living Room both have sliding glass doors that open to your Gulf Front Balcony that comes equipped with a lounge chair & patio table with chairs. So come discover the soft white sand beaches of Orange Beach/Gulf Shores and swim in the Gulf's beautiful waters. If you need to unwind, come relax on this ocean front patio and enjoy the spectacular views of the Gulf Coast. If you & your family need some quality time together, come to Orange Beach and enjoy a home-away-from-home in your nicely decorated beach-themed condo that sleeps six to eight comfortably and offers all the amenities and conveniences that you need for that perfect getaway. There are amusement parks, water parks and a ton of other activities for the whole family to enjoy! Enjoy a night in and cook up a storm in the fully-equipped kitchen. Or, spend a night out at one of the several excellent restaurants in Orange Beach. Watch the sun rise over a cup of coffee or enjoy a cocktail as the sun sets into the horizon. Whether you have children or are just a kid at heart you'll love the beach-front access, pools and hot tubs. Golf all day, shop to your hearts content, sunbathe and let the kids play, or just unwind on the patio while watching the boats go through the Perdido Pass as you sit back and enjoy the breathtaking view and ocean breeze. No matter what your preference, you can stop looking now and make your vacation a reality at our beach-front condo in Orange Beach! Parking is limited to two (2) cars per unit. You will need to visit the Phoenix VII front desk to purchase your parking passes. As of 2/10/15, Phoenix VII is charging $20.82 (includes tax) per parking pass. This price can change at any time, without notice. We fell in love with Orange Beach on our first visit to the area, prior to our wedding. I'd grown up with friends on the Atlantic coast and did business in GA & SC. I'd never really spent time on the Gulf and really can't believe that its beauty is not more publicized. The turquoise waters of the Gulf and laid back atmosphere of Alabama's coastline are incomparable. Relaxing on the beach, enjoying family time, flying kites, building sandcastles . . . did I mention time on the beach? Head board need to change. Every time you touch it make noise.bathroom exhaust very noisy, beddings smiles bad. We wash the bidding before we use it. Microwave is hard to trash liner. Thank you for taking the time to review your stay. Your feedback is extremely valuable to us as we strive to improve with each and every stay. We do apologize for the inconvenience you experienced and do wished we were notified prior to your departure. If given the opportunity, we can ensure you our housekeeping and maintenance department would have done their best to address and correct each situation. It is our goal to restore your confidence in our company by solving this problem and preventing it from happening again. Thank you again, for your honest feedback. Great location, the air conditioner didn't work when we arrived. We called maintenance the next day and they came and fixed it in a timely manner. Thank you for taking the time to review your stay with us at ALBVR. We hope to have the pleasure of serving you again in the future. Everything was good. Did notice the air condition wasn’t working and other places throughout the condo were unclean when we arrived. Kelsey, Thank you for taking the time to review your stay. Your feedback is extremely valuable to us as we strive to improve with each and every stay. We do apologize for the inconvenience you experienced and do wished we were notified prior to your departure. If given the opportunity, we can ensure you our housekeeping and maintenance department would have done their best to address and correct each situation. It is our goal to restore your confidence in our company by solving this problem and preventing it from happening again. We hope to have the pleasure of serving you again in the future. The only recommendation that I would have is that mattresses need to be replaced especially in the guest bedroom. Chanda, Thank you for taking the time to review your stay and for providing us at ALBVR with great suggestions. We have notified our owner for a mattress replacement. We hope to have the pleasure of serving you again in the future. great time with the family just not long enough ! Earl,Thank you for sharing your experience with us at ALBVR. We are very pleased to hear that you enjoyed your stay. We hope to have the pleasure of serving you again in the future. Kimberly, Thank you for choosing ALBVR. We appreciate your positive comments and very pleased to hear that you enjoyed your stay with us! We hope to have the pleasure of serving you again in the future. Please note that the nightly rates published are factored on the specials we offer for 7 night stays only. Rates published per season do vary (could be higher depending upon the time frame & specials for that particular period). The nightly rates vary depending upon how many nights, etc. Above rates do NOT include other fees and taxes. To find out the rate, please send us an email inquiry. Thank you!